By the mid 80`s the Harley side of the business was getting stronger and the business was split in two with the Harley side called Milwaukee Muscle. 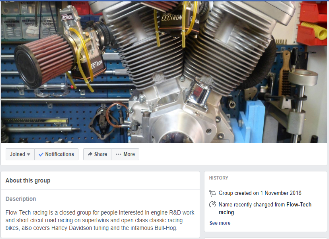 Jim was gas flowing and tuning the Evo engine back in 85 a year after they came out, these are his speciality and he was building and tuning these for UK dealerships winning the Zodiac horsepower shoot outs and the Buell challenge series. Now Jim makes his own cylinders and cylinder heads and with 40 years of experience put into the port and chamber shapes on his castings makes these heads the best and strongest available to date, with undoubtedly the best equipped HD engine machine and tuning shop in the UK no one can offer a better service. Jim Norman (aka Jimmy Doom) has been self-employed working on bikes since leaving school in the late 70`s and was soon running a road race tuning company called Flow-Tech Racing. By the Mid 80`s Jim had the first Super-Flow SF600 in the country and was tuning and winning races with 600 super-sport and 750 superbikes at National level for works teams Honda UK and for the top privateers at the time. Jim was one of the first to pioneer port filling back then achieving 130 rear wheel horsepower out of the 750 superbikes, his gas flowed Suzuki enginestthe old GS models are producing 148 rear wheel horsepower and GSX pro-stockers ran in the 7 second bracket. JD's Milwaukee Muscle is the leading Harley Davidson Motorbike Tuning, Repair and building workshop in County Durham and the North East.